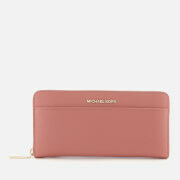 Leather card holder from MICHAEL MICHAEL KORS. 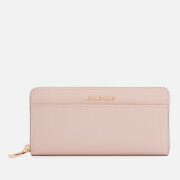 Crafted from textured leather, the 'Money Pieces' card case showcases a compact design with four card slots and a top slip pocket with a printed lining. Gold-toned appliqué branding and contrasting black trims complete the design.